When you think of candy, you probably think of the big-name candy bar brands that spend millions of dollars a year on marketing campaigns. I think of Milky Way, Reese’s, 3 Musketeers, and Skittles. It came a great surprise to me this week when I started hearing buzz about Mike and Ike. I’ll be honest. I used to like Mike and Ike candy when I was younger, but probably haven’t had a package of Mike and Ike candies since an upper-elementary Halloween. What they’ve done this past week with a creative, quirky, and viral marketing campaign has taken me away though. I first heard of the news on Good Morning America- Mike and Ike split up. At first I thought it was just another one of their celebrity gossip columns, but alas, as I looked up, I was staring at that familiar green box Mike and Ike is famous for. I found out that the two had split and were wrecking havoc on the packages, either one scribbling out the other one’s name on the package and giving a cheeky reason for doing so (“Mike spend too much time blogging”). The act was part of a new marketing campaign, and it was already getting national press. 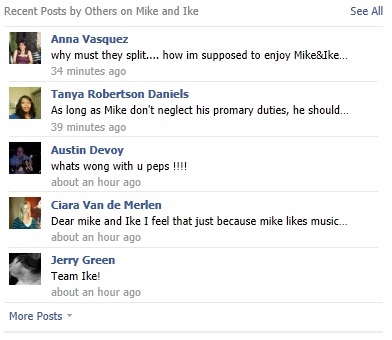 The campaign centers around the Mike and Ike Facebook page. 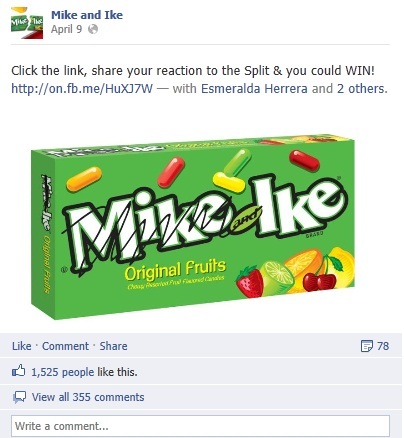 Those who purchase a package of Mike and Ike candy are even directed to Facebook in this exciting advertising campaign. 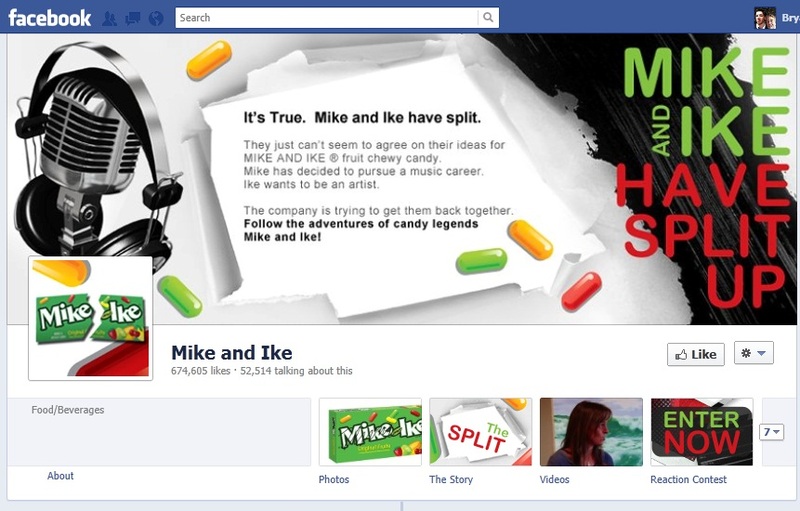 The Mike and Ike Facebook page revolves around the split of Mike and Ike, it’s header announcing the split and telling users to follow the developments. The Mike and Ike Facebook page also provides interaction with its followers, amping up the creativity and viral nature of the advertising and marketing campaign. The posts talk of what the split pair is currently doing, one post suggesting Mike was at a Rock and Roll Hall of Fame ceremony. Facebook users are embracing these posts, liking them, commenting on them, and sharing them with their friends. Users are also creating their own posts on the Mike and Ike Facebook page for the campaign, showing their support for the pair and hope that Mike and Ike will no longer call it quits. They are even playing along with the stories of what Mike and Ike are doing now, putting their own spin on what is going on in the relationship and offering suggestions on how they should get back together. 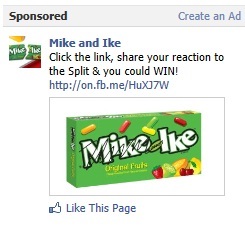 Mike and Ike is even running Facebook ads to direct users to their Facebook page. They are using premium Facebook ads on the Facebook homepage pushing out their page posts to get the word out to even more Facebook users about the Mike and Ike split marketing campaign. The Mike and Ike split marketing campaign gets even better. Developing a true integrated marketing campaign, Mike and Ike makes use of Tumblr to share the story to even more users. 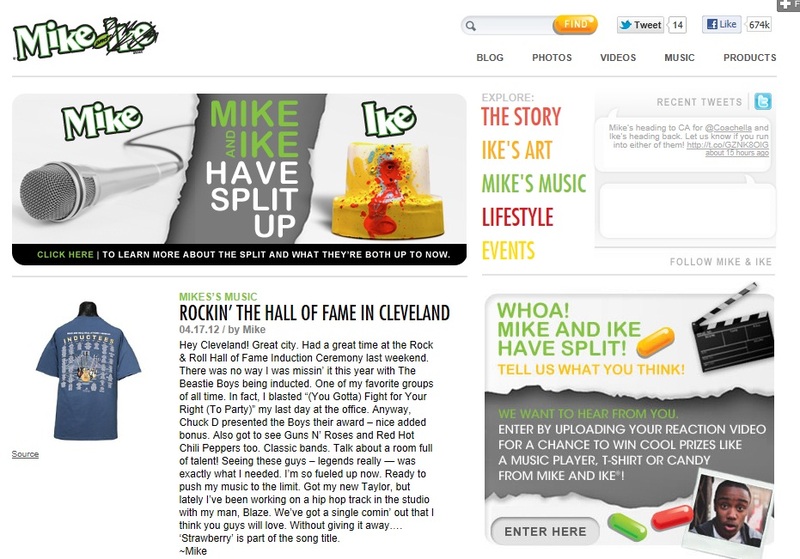 The Mike and Ike Tumblr page tells the story of the split, offers galleries of Mike’s music and Ike’s art (the different interests leading to why they’re splitting), and links users to Mike and Ike’s blog posts, where they discuss their side of the story. The Mike and Ike Tumblr page also asks users to upload videos of their reactions to the news of Mike and Ike’s split. The campaign has truly gone viral. 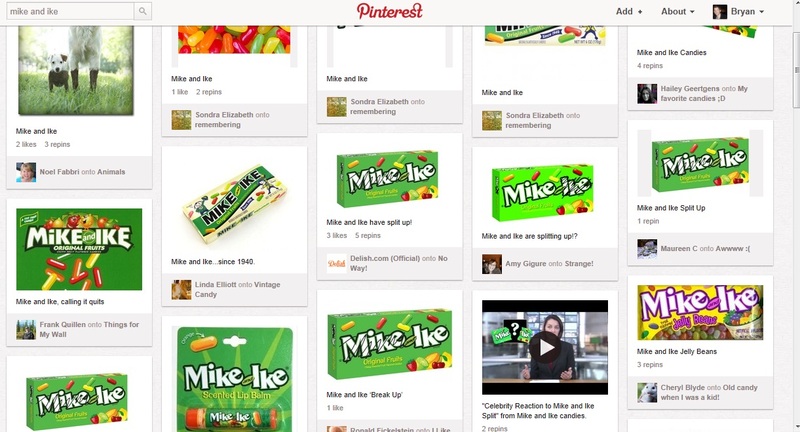 Twitter users are tweeting about the Mike and Ike split, and Pinterest users are even pinning photos of the Mike and Ike packaging split. Marketing support for the Mike and Ike split campaign will be increased in future months. TV advertisements will begin running in June, and billboards will line highways and city buildings starting in July. The entire campaign will cost around $15 million, a huge jump in comparison to last year’s number $125,000! I really commend the brand for coming up with a unique and creative marketing campaign, and for this reason I’m placing it in this week’s Marketing Spotlight. To see a brand which has had little impact on consumers over the past few years embrace the digital and social world with an amazing campaign excites me. They truly are on the right path and has put fun and personality into the childhood candy we grew up with. And as I said, I haven’t had Mike and Ike since my pre-teen years, but I will be purchasing a package soon. I really want to support a company that is willing to take marketing risks, and I only can hope for a successful campaign.